Willy is a hard going, loud mouthed, fast tracking young male. BIG, BIG bawl mouth with a huge die bawl locate, and ratchet chop on tree. He is a Field Champion with wins toward Grand, Show Champion with wins toward Grand, and is almost a water champion. He has the drive, breeding, and ability to be a Quad Champion. 5/6/17: Willy wins line and tree in his heat, and line in the final....finishing him to Field Champion. He also won line and tree in his heat, and tree in the final of the water race, and class, breed, and BOS in the show....finishing him to Show Champion! 9/10/16: Willy wins line and tree in his heat in the water race, line and tree in his heat in the field trial, and class, breed, and BOS in the show at the Wilton ARCA sectional. 8/27/16: Willy wins line and tree in his heat in the field trial, line and tree in his heat in the water race, and class and breed in the show at the Wisconsin Hunters Rights event. 8/19/16: Willy wins Class, Breed, and King of Show at the Highland ARCA redbone sectional. 8/13/16: Willy wins line and tree in his heat, and line and tree in the final of the Field trial. 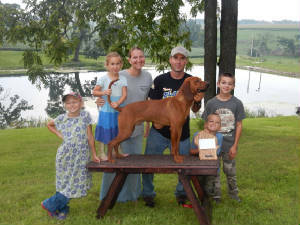 He also won line and tree in his heat in the water race, and Junior redbone male in the show. 7/23/16: Willy wins line and tree in his heat, line and tree in the semi-finals, and tree in the final of the Field trial at Hebron family fun days. 7/1/16: National Redbone Days, Willy won line in his heat, and tree in the semi-finals of the water race. 6/30/16: National Redbone Days, Willy won tree in his heat in his first field trial. ALL MATERIAL (WRITTEN AND PICTORIAL) ON THIS SITE IS PROPERTY OF RED FEVER REDBONES, IS PROTECTED BY COPYRIGHT, AND MAY NOT BE DUPLICATED WITHOUT EXPRESS WRITTEN PERMISSION OF SITE OWNER. PLEASE CONTACT US FOR CONSIDERATION OF USE.